“Then Jesus asked them, “Would anyone light a lamp and then put it under a basket or under a bed? Of course not! A lamp is placed on a stand, where its light will shine.” (Mark 4:21, NLT) Where is your light shining? This is the first year in 49 years of marriage Patti and I have not illuminated the outside of our home yet the very situations that have prevented us from decorating the outside of our home have turned up the intensity of Jesus’ Spiritual Light thus illuminating our life/living with Heaven’s Light, the Light that shines not only at Christmas but every day thereafter! The Good News of Christmas is the Holy Spirit under the Ministry and Instructions of Jesus transforms our everyday darkening adversities into Heaven’s “Manna Light” instilling in us the Hope, Love, Peace, and Joy of Jesus to take us above the adversities and illuminating our dark world below. The Miracle of Christmas is Light, but not just any light the Light of God as illuminated in the life/living of Jesus! 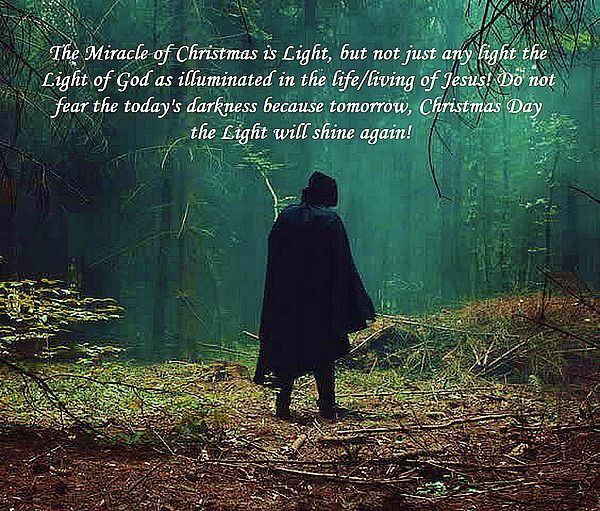 Do not fear the today’s darkness because tomorrow, Christmas Day the Light will shine again!